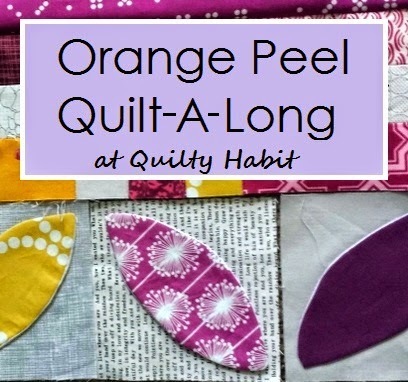 Welcome to the third post of the Orange Peel Quilt-A-Long! The final linky party doesn't start until August 23, so you have plenty of time to try orange peels out and whip something up! See here for everything about the QAL, including the three categories, recently announced prizes, and Viewer's Choice contest. Pinterest Inspiration Board - in case you need some inspiration. I will keep adding to it throughout the QAL! Please share this button on your blog if you are participating! Thank you so much to the wonderful QAL prize sponsors! Orange peels of any kind must be a main design element of your project. This will be taken into account during judging. You may link up one entry per category (via blog or Flickr). Please include dimensions when you post! The three categories are quilt, "just the top," and mini - see the official page for details. Your project(s) must be made in 2014. Today we are going to take an in-depth look at the "stitch and flip" or interfacing method (these are my own names for it). If you are looking for a relatively quick (depending on how many you are making) and easy method, give this a try! If you want to use machine or hand applique, I can't wait to see what you do! 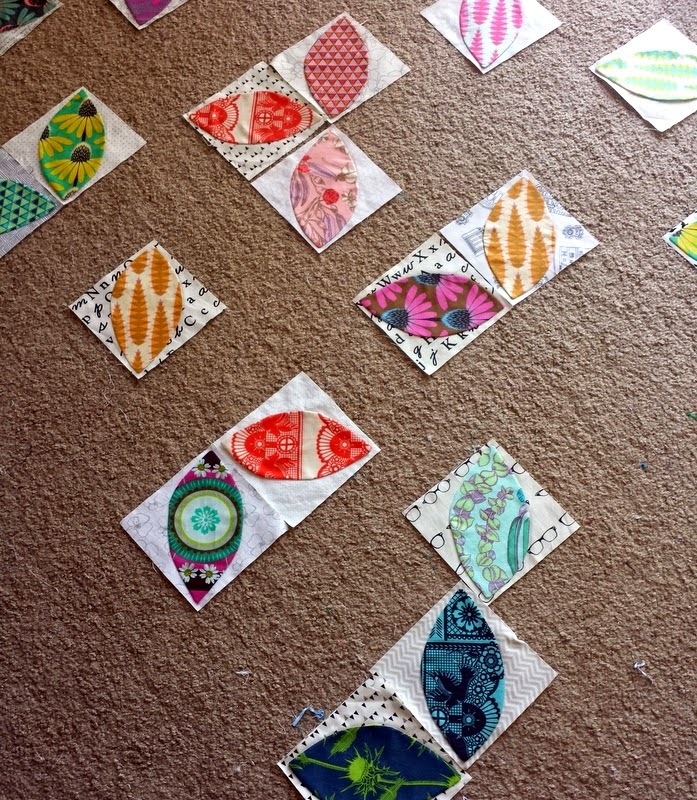 You can find links to tutorials for those methods (and the supplies you will need) on the second QAL post. I stumbled upon the "stitch and flip" method on Emily Herrick's blog, Crazy Old Ladies (she's also @crazyoldladies on Instagram). Emily just released a new collection with Michael Miller, Rustique! I asked her if she would be okay with me adding in some advice in addition to her tutorial, and she was totally cool with it. Thanks Emily! 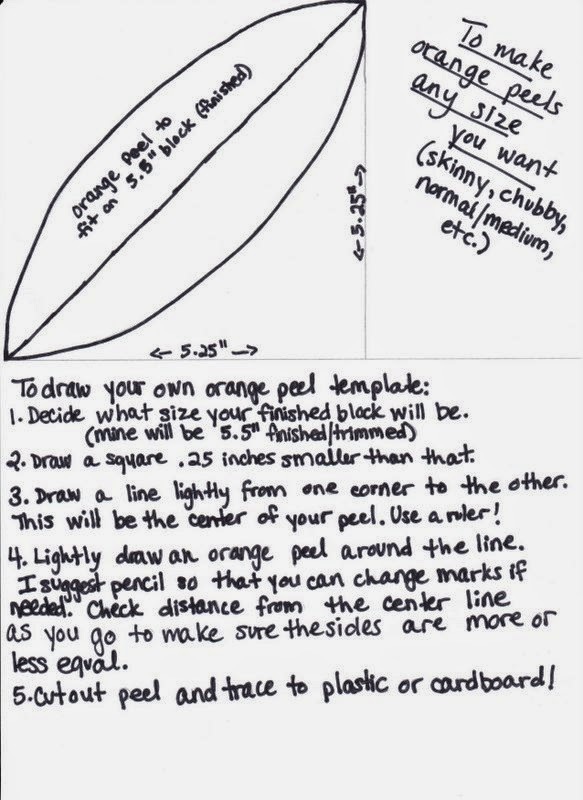 For any method of attachment: you can draw/design custom-sized orange peels (skinny, chubby, just in the middle, etc.). 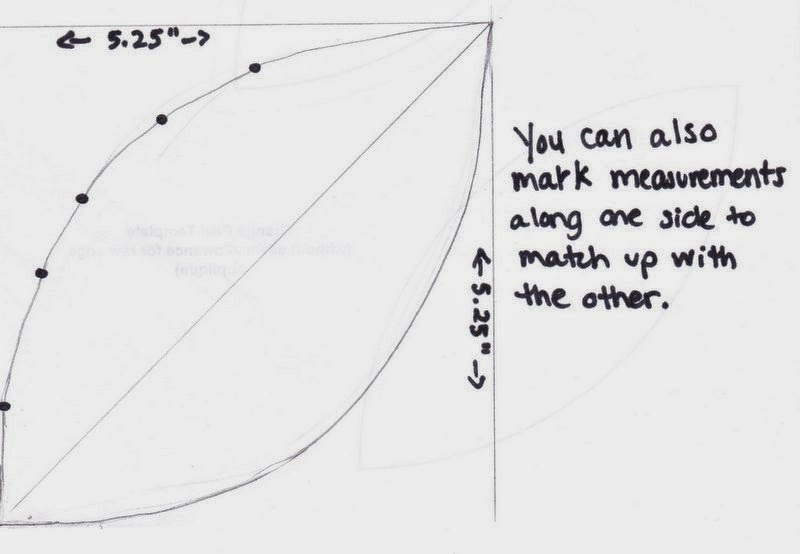 Emily explains this at the beginning of her tutorial and I've made a visual representation and written out directions (below) that explain how. I hope it is helpful. This is how I made my baby quilt - it works! Just as a note - my background squares are 5" finished/sewn into the quilt. When I say "finished" on the explanation, I mean trimmed/ready to sew into the top. Hopefully that makes sense. Please note that these are not actual templates! I'm still trying to figure out how to attach PDFs and Word docs to Blogger (does anyone know?). Also, the last drawing is the one I used for my baby quilt because the first was skinnier than I envisioned. 1. Trace your orange peels onto the NON fusible/rough side of the interfacing (it's just easier!). 2. Cut them out leaving some room (Emily says about 1/4" around but I cut smaller). 3. Cut out a rectangle of fabric for the peel (This is the perfect scrap project! I cut into my Pretty Potent though :( ). 5. Trim around the whole thing, leaving about 1/8" around. 6. Cut a small slit in the interfacing ONLY, and flip the whole thing around so the rough/adhesive and right side of fabric are now facing outwards (see the tutorial for more on this). 7. Center on your background square and press with a nice hot iron! 2. Emily suggests using a stylus to flesh out your peel and push out the tips. I found that a moderately sharp pencil tip works well too, since I don't have a stylus (but I was VERY careful - the pencil tip could go right through the top - ask me how I know). Overall, interfacing can be quite fragile so just go slowly! 3. When you press your peels to the backgrounds (and center them), make sure you press from the top (again, ask me how I know). Don't be a lazy presser. I really had to psych myself up for a marathon pressing session but it was all worth it. 4. If you follow this method, I suggest calculating how many orange peels you need and doing them in batches. I completed all 29 of mine one step at a time as I marathoned Parks and Recreation. 5. 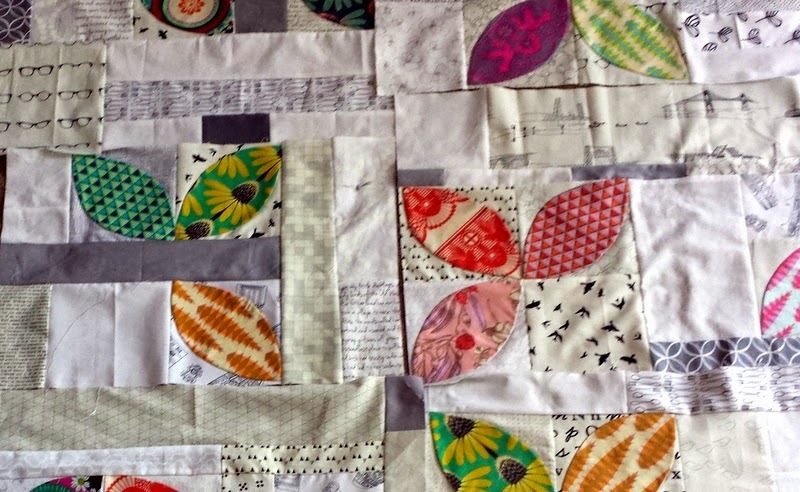 At the end, you can quilt down your peels in whatever way, or you can machine or hand applique. If your iron was hot enough, your peels will stay down for a time, but to ensure that they do long term, stitching them down in some way is an important step. I am top-stitching the orange peels down (as Emily also suggests) by starting at the middle of the orange peel (it's easier than starting at the tip in my opinion) with a 3.0 stitch length very close to the edge (less than 1/8th of an inch). I hope this helps! I'll have a post up about my baby quilt top tomorrow. And check back next Monday for a guest post by my friend Ashley! 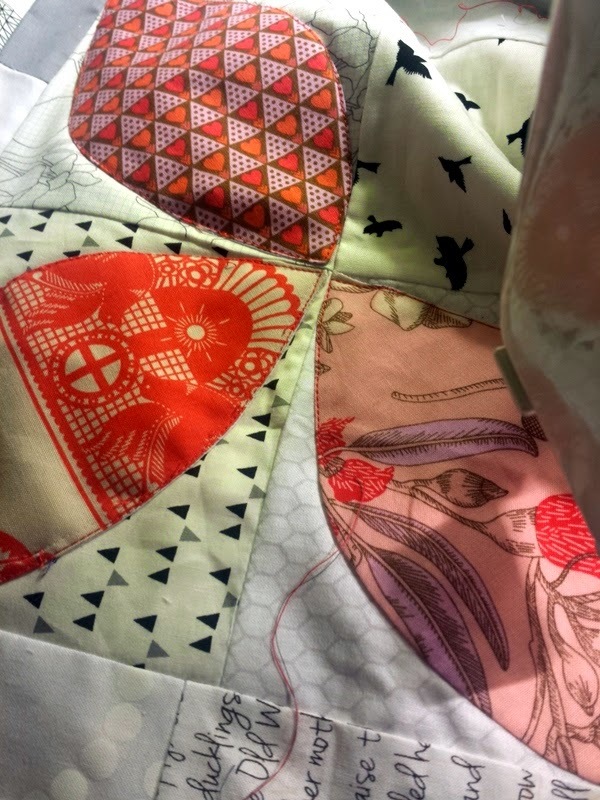 We'll be getting more into the applique and quilting aspects soon, and the QAL halfway mark/link up is only 2 weeks away! #orangepeelqal on Instagram - share your design, progress, and finish photos - this feed is so fun to scroll through so far! Flickr Group - share your design, progress, and finish photos. Also, chat with other participants - conversations are developing in the "discussions" bar about which method you are using and what your design ideas are! August 23 - September 8: Final Link-up! I love to follow this QAL. Sadly, I planning something but I won't finished it for September, I was planning Christmas. And I'll be using fusible web. 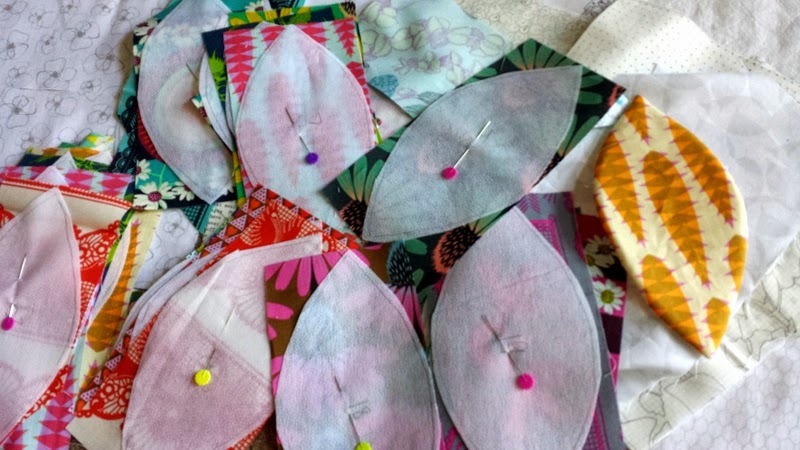 I already tried your method with interfacing, for doing circles. It works well. For attaching documents in blogger, the only I found to do it is to use a "Google doc" and then link to it in your post. You used a sad face about using your Pretty Potent?! But it's so pretty! And you're using it in a lovely way. I decided to go with this method because I love the smooth edges and I'm using interfacing scraps! I cut out most of the interfacing petals during the last guild meeting. I am using a mini charm pack, so finished they are going to be so tiny! I was thinking of sewing the interfacing onto the squares, then cutting out the fabric petals--one less tracing the shape and cutting it out. Plus they're tiny. and having the whole square will be easier to handle. Thanks for all the good info and the link to Crazy Ladies' tutorial! I just made my first "demo" orange peel. I can't wait to work on my project. Love learning something new!